This original oil painting is donated by Lt Gen Sir Hew Pike KCB DSO MBE, who commanded 3 PARA on the Falkland Islands 1982. 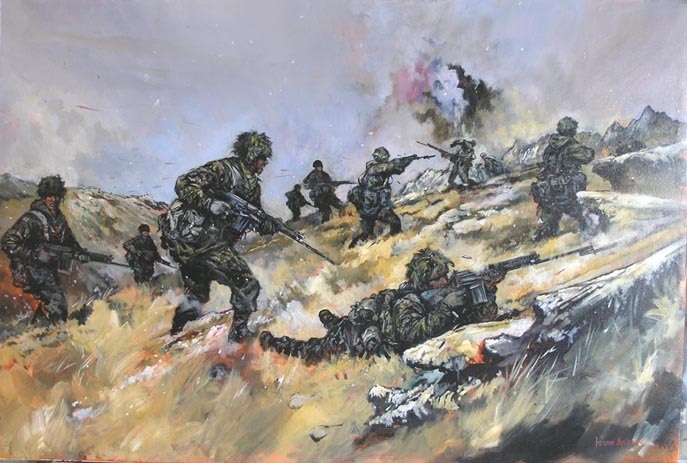 Painted by noted military artist Jason Askew, it shows the battle for Mount Longdon, one of the fiercest encounters of the war. His men suffered heavy casualties taking the mountain in a battle that lasted from 9pm to 7am the next day. Pike was awarded the Distinguished Service Order for his “cool example and inspiring leadership”. It also comes with a CD account of the battle, narrated by General Hew.